Need an idea to fancy‐up a teacher gift in a hurry? Here’s your solution! I designed a printable teacher appreciation gift wrap and tag set that can be used with standard gift packaging to create pretty gifts ASAP. Download this printable wrapping set for free (YAY!) and show those teachers how awesome you think they are. Tie a bouquet of pencils, stack of post‐its, or other classroom supplies together with patterned wrap and wide ribbon, and attach tag. The set includes a 2.5 x 10″ wrap and 2 “thank you” gift tags. 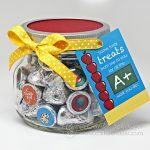 This gift wrap set coordinates with the Teacher Appreciation Candy Jar Gift printables (also free! ), which includes candy circles, a gift tag, and a mini‐card. Use them all week and show thanks to those teachers working hard to help our kids learn. So awesome! Thanks for joining!